Blue Springs is an efficient courthouse with court dates available on Saturday for working people. Blue Springs has some of the finest and fairest Prosecutors in the City. They will generally amend a ticket to a defective equipment. A defective equipment is a non-moving violation that will not appear on your driving record and will result in no points on your record. Why Hire a Lawyer for your Blue Springs Speeding Ticket: There’s a lot of reasons – a big one is your insurance will go up. Click here is all the information you need to know. A defective equipment will cost you between $150.00 and $275.00. My charge for Blue Springs is $150 per ticket. We accept checks, cash or credit cards. Please call at 816-399-5241 or fill out our Free Estimate Request for a detailed quote on having that Blue Springs speeding ticket off of your record. Blue Springs is one of the only courts in the area that has a Saturday morning court schedule. Generally, they hold Court on Tuesday and Thursday evenings and Friday and Saturday mornings. 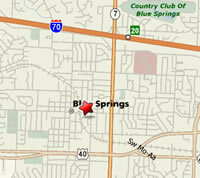 Most likely, you will not have to appear, but Blue Springs makes it easy to make a first appearance on a Saturday. Blue Springs, like that of so many Midwestern communities, is tied to the migration of settlers on their westward journey. Named for the springs used as watering holes for wagon trains, the community of Blue Springs was organized as part of Jackson County in 1827 and became the fourth settlement in the county, pre-dating Kansas City. By 1980 the City had grown to almost 26,000 and today, Blue Springs is one of the fastest growing communities in Missouri with 48,080 residents according to the 2000 census. A 1998 study commissioned by the city learned that 44 percent of the city’s residents are young, well educated with high incomes. More than four out of every 10 residents are homeowners. Twenty-one percent of Blue Springs population is “starter families.” According to the study, 17 percent of Blue Springs residents represent multi-income families with school-aged children, headed by well-educated executives and professionals.